"A weapon of extraordinary magic and great strength. Disables the gaining of experience." Satisfy Mushroom XIII: No. 13. 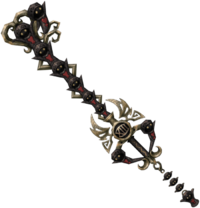 The Winner's Proof is a Keychain for Sora's Keyblade that appears in Kingdom Hearts II Final Mix. Sora is rewarded with the Winner's Proof after satisfying the first twelve of the Mushroom XIII and returning to The Great Maw to find the thirteenth. Winner's Proof displays exactly thirteen Mushrooms; four in the links and Keychain, two in the handle, six on the blade, and one of them serves as the teeth. The tip of the weapon bears a resemblance to a heart, making it similar to the Ultima Weapon. The Winner's Proof's name stems from the fact that to acquire it, Sora needs to pass thirteen tests, one for each Mushroom. Out of all of Sora's Keyblades in Kingdom Hearts II Final Mix, the Winner's Proof has the highest Magic bonus, making it extremely potent when used with a magic-focused form like the Wisdom or Final Forms. When the Keyblade strikes the enemy, the Keyblade produces images of flowers and small stars, some of which include the Mushroom XIII's faces.